While the name retroreflectometer sounds like a flashback to 1970s disco lights, our 12-kilogram mobile marking retroreflectometer is mounted on the side of a ministry vehicle. As the vehicle moves, the device gauges how the line markings and raised pavement markers (like cat’s eyes or road studs) below are holding up, and the brightness they are delivering. The data flashes across a screen inside the vehicle, to give a live reading of what’s being measured, and allows the operator to make adjustments to the device. Retroreflectivity, or low light visibility, is crucial to highway safety. When your vehicle lights connect with the pavement markings, the retroreflectors (usually tiny glass or plastic beads) embedded into the lines, bounce the light back to your eyes. In addition to the retroreflectivity data, the device stores information about the contrast between the pavement and the marking, marking coverage, line type (eg. solid, broken, double), line width, GPS coordinates, temperature, humidity, performance of raised retroreflective pavement markers, vehicle speed, date, time, and user-programmed information. The device can measure both white and yellow, and flat and inset markings, on roads that are smooth or rough, under various light conditions. We’re expecting the paint will stand up better to scraping snowplow blades, studded tires, chains and the scouring effect of winter traction grit under vehicle tires. The other key aspect of this “thicker” and “stickier” paint is that it holds onto the new slightly larger glass beads that we’ll be using to enhance the line’s visibility. The new paint and blend of beads will be applied on sections of provincial highways, where paint endurance and visibility have been less than glowing. This includes stretches of Highways 1, 3, 3A, 3B, 4, 4A, 5, 7, 14, 16, 18, 19, 22, 27, 97, 97A, 97C, 99 and the Coquihalla and Malahat Highways. We’re excited about using our new retroreflectometer and expect it will play a shining role, as it helps us with the science of developing better, brighter pavement markings. Is there any plan to also upgrade reflector posts alongside highways? Major highways at night are completely unlit in the distance – there’s simply no high performance reflectors anywhere along the road. Discussed above are the challenges in developing durable and highly reflective paint, so is there a reason there isn’t more effort put into reflector badges on posts alongside the road? Posts can be built taller than winter snowbanks (as in Norway) and can light up the shape of the road in the distance (as in Australia). I grew up in Australia where the reflector posts are plentiful and very bright, with each side of the road typically coloured red or white to match brake lights / headlights. That seems to me a low cost solution and I’m curious a) if it in fact isn’t or b) if it is, where it sits in the priorities for sections of highway like the 99 (or Highway 1, boy was that an adventure to drive at night in a winter snowstorm). Hi Adam – we’ve sent your comment to our traffic engineers for review. Stay tuned. Hi Adam – thanks for your comment. The use of reflector posts (delineation) on British Columbia highways is an enhancement tool that may be used by our Traffic Engineers as described on Page 7.26 of our Manual for Traffic Signs and Pavement Markings. When considering reflector posts, engineers consider factors such as roadway geometry, safety performance and other measures, such as enhanced signing, that have been applied. Exercising engineering judgment is encouraged with most road safety measures as each roadway is different and what works well at one site may not work well at another. Reflector posts are particularly beneficial in areas with frequently wet or foggy conditions, and without illumination, similar to those found outside major cities on the coast. Reflector posts may also be employed in areas of safety concern. The shortcoming of reflector posts is their fragility in areas with severe winter conditions. Snow plows can easily knock over or damage the posts which results in intensive and costly maintenance in the Spring. Even reflector posts made taller than snowbanks are damaged from the force of snow removal. Due to winter maintenance, reflector posts are usually not cost effective in areas of the Province which experience severe winter weather conditions. Although individually reflector posts are inexpensive, it is important to remember the quantity that are needed to properly delineate a curve or highway section. The ministry spaces reflector posts at between 5 and 60 m, depending on the highway speed limit and geometry (curve or tangent section). With this frequency, a 1 km section of highway will have over 30 delineators. With over 40,000 km of paved highways, it is important to prioritize any measure and apply them only in areas with greatest need. In locations where severe weather conditions are not present, the ministry has endeavored to increase the use of reflector posts – Highway 14 is a great example. On April 29, 2018, I sent feedback informing you that on Hwy 99 between West Vancouver and Squamish, lane paint visibility during rainy nights has been awful. There’s negligible pole lighting, there’s no “cats eyes” and LANE PAINT IS NON REFLECTIVE,,, in places, BARELY VISIBLE. Located between the 4×4 reflectors on the concrete barrier and the 4×4 reflectors in the ditch one must navigate a two lane wide blank void . The last paragraph of May 17, 2018 seems to make clear that for winter 2018 – 2019 there will be no improvement to the quality of pavement markings on the Sea to Sky section of Hwy99. Another year of the same; Is this correct? In April 2018 TranBC announced it had tested the new higher quality WB paints in several areas last summer & fall and they have done well. The next step is to get them into wider use through the new line marking contracts being issued this summer to be in place by December 2018. It’s common knowledge that pavement markings on the Sea to Sky have been less visible since oil-based paints were discontinued in 2010. The existing inferior substitute is the product Miller Capilano has been using for almost a decade! You state, incredibly, that the existing paint is equivalent to that in the upcoming contracts to be used elsewhere in BC, so the BC Ministry of Highways will not be asking the concessionaire to change their pavement marking products or practices. Why the conflicting information… the new line marking contracts to be in place by December 2018, or the status quo? While the actual paint has not changed, we are now using larger glass beads in our paint on the Lower Mainland and Vancouver Island, which will increase their reflectivity by 20 per cent. We are also applying a second pass of paint to add thickness and improve visibility and durability. This is taking place in the Lower Mainland and on Vancouver Island due to the conditions and needs in the region. This formula would not stand up to the conditions and highway maintenance necessary in the Interior and Northern regions of the province. The paint that was announced last April was a pilot project to test a potential new formula for the next contract, which will go into effect on December 16, 2018. Current paint contractors are using the high quality formula agreed to in the current contract, and the pilot project, high build formula that was tested last year remains under consideration for the next contract. We hope that this helps answer your question. Please let us know if you have any other questions. Yes, I have a couple more questions. I’m seeking clarity because this is a highway safety issue pertaining to clear visibility of pavement markings. I’m concerned only with the Sea-to-Sky highway portion of Highway 99, from Eagle Ridge Exit 2 to Squamish and beyond; not to the entire Lower Mainland and Vancouver Island. Earlier in this blog, May 17, 2018 you said the BC Ministry of Highways will not be asking its maintenance contractor to change the pavement marking products or practices on the Sea-to-Sky when the pavement markings are repainted in December 2018. Now May 28, you appear to be saying the BC Ministry of Highways maintenance contractor will be using larger glass beads in the paint on the Sea-to-Sky, which will increase reflectivity by 20 per cent and will be applying a second pass of paint to add thickness and improve visibility and durability. Is the BC Ministry of Highways now asking Miller Capilano, its maintenance contractor, to ensure the paint is more durable and 20% more retroreflective? If the paint planned for use on the Sea-to-Sky will not stand up to conditions for highway maintenance required in the Interior and Northern regions of the province, and the existing paint used on the Sea-to-Sky is entirely ineffective, why gamble to improve it around 20% when much better is available? Our apologies for any confusion. As explained earlier, the Sea-to-Sky section of Highway 99 is under a concessionaire agreement and the concessionaire has contracted their maintenance contracting services to Miller Capilano. Miller Capilano uses products from the ministry’s approved product list, including a glass bead that is similar to the larger glass bead that will be required in the new pavement marking contracts. As Miller Capilano is already using pavement marking products on the Sea to Sky Highway, that are equivalent to those in the upcoming contracts for elsewhere in BC, we will not be asking the concessionaire to change their pavement marking products or practices. The pavement marking products used by Miller Capilano on the Sea-to-Sky may be equivalent to those for use in the upcoming contracts elsewhere in BC but are not effective in this area of BC. The retro-reflectivity of the lane paint on the Sea-to-Sky is pitiful and has been since 2010. MOTI has developed a superior product but unfortunately has locked itself into a 25 year contract with Miller Capilano and doesn’t want to write a purchase order for the difference it would cost to switch to the better product. How pathetic! We’ve already suffered one bad experience on the Sea-to-Sky with “equivalent products” supplied by Miller Capilano. We’re asking MOT to ensure we don’t suffer another bad experience. The first bad experience occurred in 2014. In 2013 MOT retained BLK a consulting engineering firm to do decibel testing and to prepare a report recommending a suitable quiet asphalt pavement design for a section of Hyw99 where decibel readings exceeded MOT guidelines. Residents in the area were suffering health problems caused by traffic noise. The consultant recommended a product known as Open Grade Friction Course (OGFC) which was also recommended and used effectively where Hwy99 passes the community of Lions Bay. But it was not used in this case. Why?… because MOT was persuaded by Miller Capilano to use a cheaper “equivalent” product called Micro Surfacing and the noise problem continues to this day. A lesson to be learned by MOT is this: Don’t allow yourself to be locked into 25 year long contracts when technology is constantly changing, unless you’re prepared to issue a purchase order to fund the difference in cost to upgrade to the real McCoy. Be wary of the term “equivalent”. 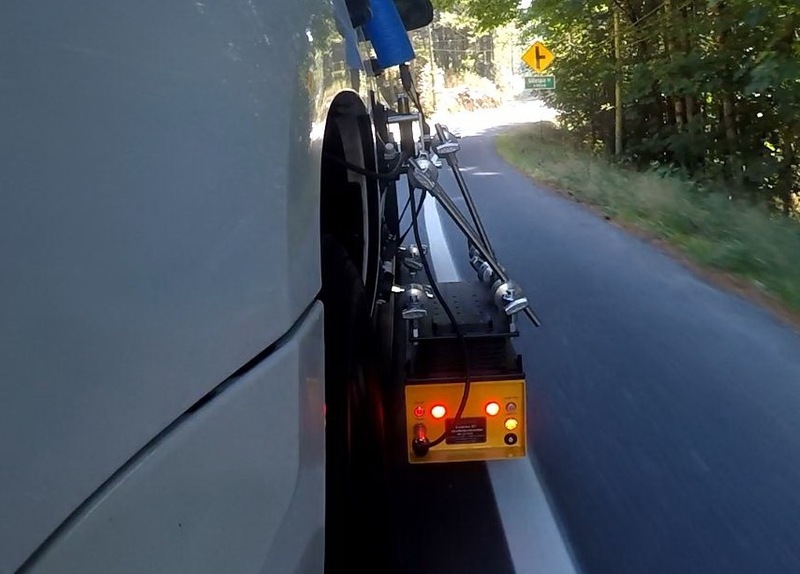 In May 2018, the BC Ministry of Highways stated its maintenance contractor Miller Capilano Maintenance Corporation (Squamish) would be using larger glass beads in the white lane paint on the Sea-to-Sky highway, to increase reflectivity by 20 per cent and MCMC would be applying a second pass of paint to add thickness and improve visibility and durability. Well, MCMC tried to go one step further and cut a trough in the asphalt before applying the paint… presumably to improve durability by setting the paint lower than the tire treads thereby avoiding tire abrasion. Now we have a worse problem. On rainy days the troughs fill with water causing the headlights to refract everywhere but backwards towards the driver. There is now barely any recto-reflectivity on rainy days and zero reflectivity at all on dark winter nights when we need it the most. Sinking lane paint in troughs works great in desert regions, but not where it rains like in coastal BC. Thanksgiving Weekend evening October 7th I drove from Abbortsford to Lions Bay in drizzly wet weather. The visibility of highway marking was exceptionally good in the Fraser Valley where the high quality paint has been applied. Upon reaching West Vancouver where Hwy 1 ends and Hwy 99 begins it had become progressively worse. Hwy 99 north of Horseshoe Bay where the troughed asphalt fills with water, the white lane paint could barely be detected along the trough edges; everywhere else it had disappeared below a puddle of water. I dread to think what it will be like on stormy wet winter nights! It’s going to be like driving through a dark tunnel not knowing where the lanes are. This is a recipe for accidents. I suggest the most cost-effective option to correct the problem created by the troughs in the asphalt is to set Stimpsonites or “Cats Eyes” in the troughs so the reflectors protrude above the tops of the puddles. Hello Katdek and thank you for your comment. We shared your comment with our local area manager and Miller Capilano for review. If you could kindly identify the exact areas where the lines are not visible due to pooling water we will review with Miller Cap next week to see if anything is out of spec. Can you explain why road marking that used to last years, are now dangerously eroded in a matter of months. I am told that the previous oil based paint was considered toxic? This leaves me somewhat confused as the complete asphalt road is oil based? I have trouble believing that oil based paints were the reason for the old, long lasting paints could have been that bad? Especially when I would like to assess the increase in injuries and deaths of humans from faded road markings. I look forward to watching the new higher visibility paint, but truly hope that it will also last longer than existing paint – lets find a balance of the environment and safety of drivers. New “Stickier” Paint, Bigger Beads for Lasting Brightness, possibly even thermoplastics and plastic polymers will be applied on sections of provincial highways where paint endurance and visibility have been less than glowing. Highway 99 between Horseshoe Bay and Squamish is one place where paint endurance and visibility have been less than glowing. The Sea-to-Sky highway to Whistler along Howe Sound is a challenging highway to drive after dark, particularly during the winter rains. In addition to the roadway constantly winding as it follows the contour of the mountains, there’s negligible pole lighting, there’s no “cats eyes”, lane paint is barely visible let alone reflective, oncoming traffic headlights are blinding… at times it can be a most nerve-racking ordeal. Please advise if this section of Hwy 99 is to be included. Thanks for your questions about pavement markings on the Sea-to-Sky Highway. I am checking into this and will get back to you here. The website informs that the BC Ministry of Highways entered into a CONTRACT with MCMC the concessionaire to maintain and rehab of the Sea-to-Sky Highway for an extremely long period; from June 2005 to September 2034. In the interest of motorists’ safety, specifically visibility, will MCMC the concessionaire be given a purchase order and be required to use the new stickier type paint capable of being placed in thicker applications and of holding larger more reflective glass beads, or will the concessionaire be permitted by MOTI to substitute some less expensive product? Thanks for your questions about our concession agreement with the Sea to Sky Highway Limited Investment Partnership (SSHILP) to design, build, finance and operate the Sea-to-Sky Highway, and whether the requirements in upcoming pavement marking contracts for elsewhere in BC, will affect this route. The Sea-to-Sky project was initiated to improve highway safety, travel times and capacity between Horseshoe Bay, West Vancouver, and Function Junction south of Whistler. SHILLP (the concessionaire) had to design, build and finance two-thirds of highway improvements, and operate/maintain the highway for 25 years. SHILLP has contracted out the maintenance activities for the route to Miller Capilano Corporation. One of the safety upgrades was introduction of inlaid highly reflective pavement markings. Miller Capilano uses products from the ministry’s approved product list, including a glass bead that is similar to the larger glass bead that will be required in the new pavement marking contracts. These beads help the pavement markings be brighter at night. They will be used with MMA (Methyl Methcrylate) due to its durability and suitability for heavily trafficked roads. As Miller Capilano is already using pavement marking products on the Sea to Sky Highway, that are equivalent to those in the upcoming contracts for elsewhere in BC, we will not be asking the concessionaire to change their pavement marking products or practices. Hopefully the new resin will make a big enough difference for driving in the rain in the dark. Cant believe how useless the current lines are in those situations. It would also be smart for the province to start installing some fencing rather then just the pathetically low concrete dividers to reduce glare from oncoming traffic in low light/dark driving situations. Hi Jesse – great feedback – thank you! does it take into account the angle (line of sight) for low riding vehicle such as sports cars or high riding vehicles like a tractor-trailer? Are you referring to the reflective beads? If so, the beads reflect light from various angles. Thank goodness. Nothing worse than no v isible lines on the road, especially at night in poor driving conditions.